I've been waiting for a good Sephora 500 Point Perk to come up for ages. Since the last awesome Benefit set (consisting of a full size Coralista blush and travel size BADGal mascara), I've been holding onto my points to spend them on something worthwhile. 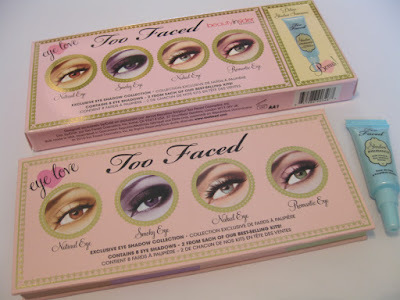 After months of dull sets consisting of dinky deluxe samples and boring old skincare products, something finally caught my eye. 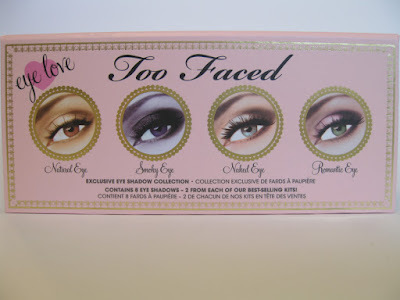 The Too Faced Eye Love collection comes with a generously sized palette consisting of two shades (although some are named differently.. but I'm pretty sure they're meant to be the same exact shade) from each of their popular "(blank) Eye" palettes including Natural Eye, Smoky Eye, Naked Eye, and Romantic Eye. 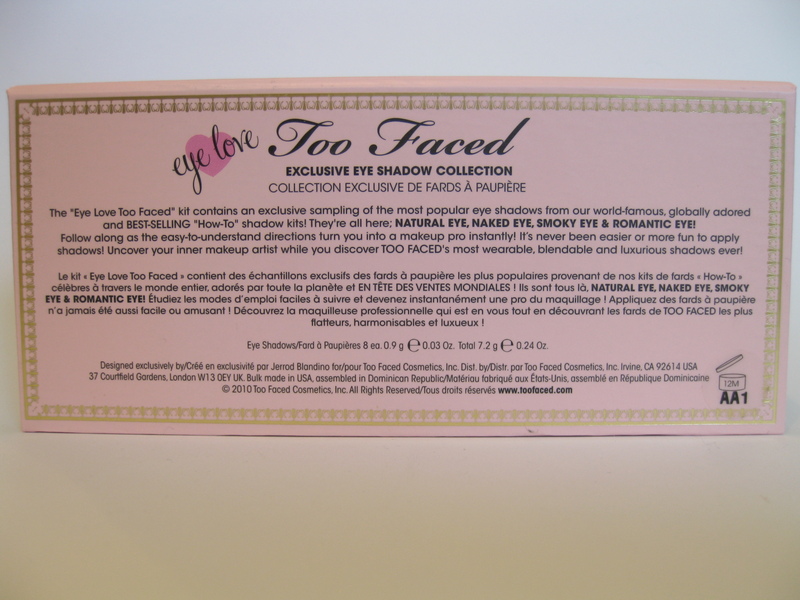 It also comes with a deluxe size tube of their popular Shadow Insurance eyeshadow primer. 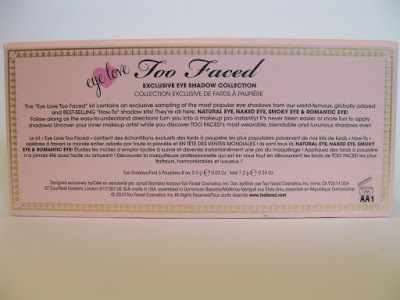 Unlike many of Sephora's other 500 Point Perks, this palette is fairly large and contains great quality eyeshadows. 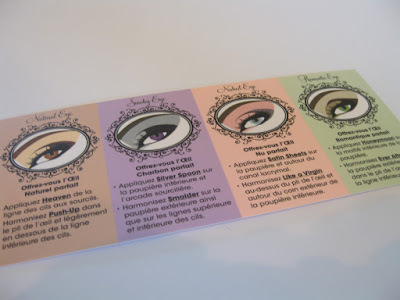 The first Sephora 500 Point Perk was a horrible Kat Von D palette so this is a major turnaround from that! 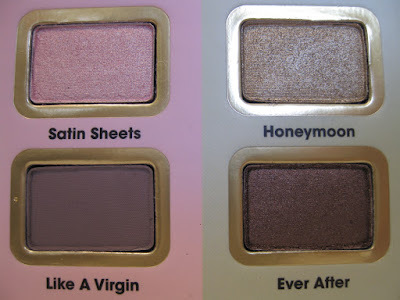 Now about the palette -in size, I'd say it's a huge step up from a sample or deluxe sample but slightly smaller than a full size high end palette. 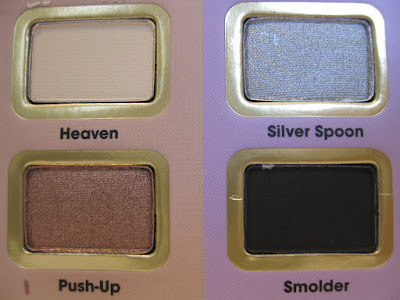 Luckily, all of the eyeshadows are pigmented and apply smoothly and are of the same high quality eyeshadows from Too Faced's "regular" eyeshadows. The set also comes with a mini tube of TFSI which I love (review here). 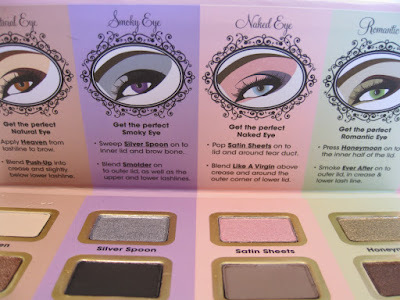 Although I don't think the shades go well together, they are all gorgeous and will look great on their own or mixed with shades from outside this palette. In my opinion, there truly isn't a single dud. Overall: If you're like me and like to hold onto your points, I recommend splurging on this fabulous set. I rarely ever use my points for the tiny deluxe samples (that cost 100 points) because I like to save up for the bigger 500 point prizes. Prior to this, I actually redeemed 1,000 points for two Coralista sets (to give as gifts) -now I regret doing that and wish I'd gotten two of these instead! In order to receive the Eye Love Collection, you need to be part of the Beauty Insider Program at Sephora and have at least 500 points. Basically, every dollar you spend equals one point. Sephora also offers prizes for 100 points -they're usually small deluxe samples which is why I think it's well worth the wait to just save up 500 points (or more) as opposed to getting a bunch of tiny 100 point gifts. I got mine IN STORE on Thursday night. Only one Sephora in my area had it but I heard from the (other) store that they would be getting it in soon. As of right now, they do still have the set available online. Limited quantities available. OMG I wonder if this is in store too! what a great 500 point perk! @ Anna Elizabeth.. I read that there were limited quantities so order soon if you think you'll want it! @ Tara.. Aww.. what about online? 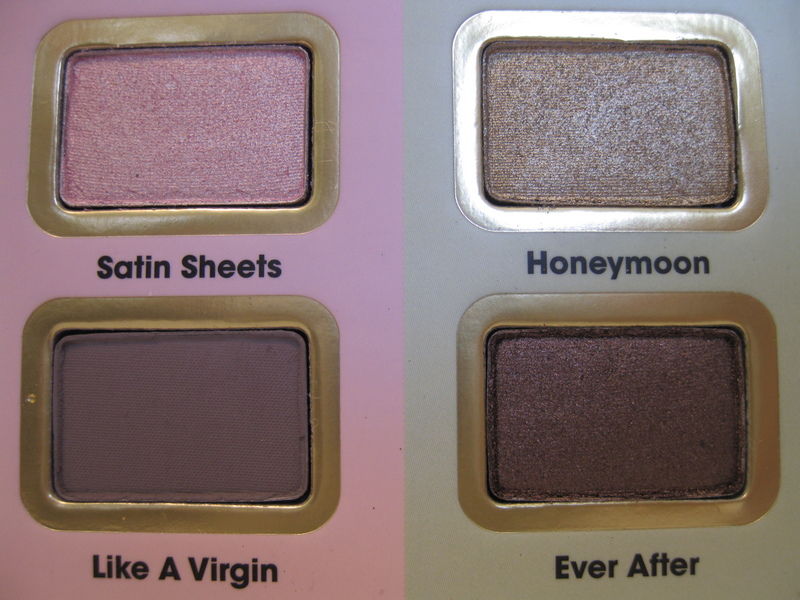 Hmmm, that's a weird palette but I actually quite like it, congratulations! 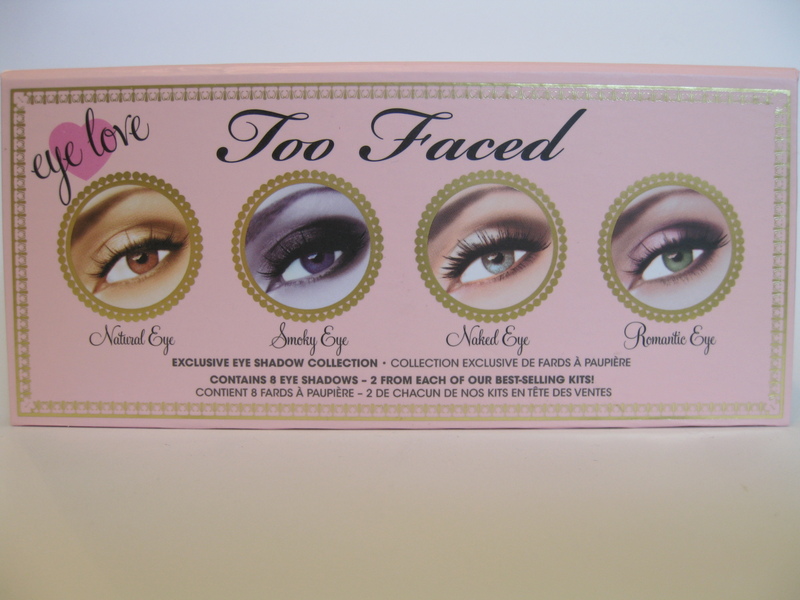 this is so pretty, i totally want it but im at like 300something pts right now.. gah! I went by today and got it. Thanks so much for letting me know! Just picked this up today. I'm a point hoarder and always scared to redeem them because I just KNOW something better will come but this set was sooo worth it. It's just beautiful. It's a great summer pallet. YAY! i've been looking for a review of this for a couple days now. I made a hefty order to sephora and I am going to get this so i wanted to see what i was actually gonna get. Thanks!! Thanks for your review- mine should be delivered today and after seeing your photos, I am glad I got it!